If you don’t know who Jim DeWitt is, you should, especially if you are a boat owner and would love to have your boat immortalized by one of the greats. 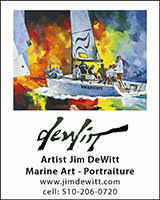 Jim has spent his career painting beautiful versions of many, many boats over the years, and can paint yours as well. Just click here for a rare opportunity to have an incredible talent do some magic for you!